Wonderful home on the Deschutes river with a private dock! Property 10: Wonderful home on the Deschutes river with a private dock! Dog-friendly house with a large yard - river access nearby! Property 12: Dog-friendly house with a large yard - river access nearby! Enjoy a private hot tub & modern comforts at this dog-friendly Sunriver getaway! Property 18: Enjoy a private hot tub & modern comforts at this dog-friendly Sunriver getaway! Property 19: Private Log Cabin in Bend w/ Deschutes River View! 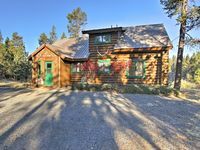 Property 20: Pet Friendly Log Cabin near Sunriver w/Hot Tub, Fire Pit, Kayaks, Bikes & Game Room! 4BR Riverfront Villa, Quiet and Upscale! Property 22: 4BR Riverfront Villa, Quiet and Upscale! 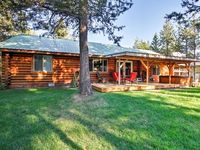 17166 Crane Drive is a custom Built Log Home On The Big Deschutes River. Property 23: 17166 Crane Drive is a custom Built Log Home On The Big Deschutes River. Stay 25 minutes from Mt. Bachelor! Ask about free nights! Dogs welcome! Hot tub! Property 25: Stay 25 minutes from Mt. Bachelor! Ask about free nights! Dogs welcome! Hot tub! Woodland home on one acre w/ hot tub, deck & bikes - 500 yds to Deschutes River! Property 26: Woodland home on one acre w/ hot tub, deck & bikes - 500 yds to Deschutes River! MOUNTAIN VIEW RETREAT **Winter/Spring Special: 10% off or 4th night free! Property 27: MOUNTAIN VIEW RETREAT **Winter/Spring Special: 10% off or 4th night free! Luxury Vacation Home, AC, Foosball, Ping Pong & Brand New Hot Tub! Property 29: Luxury Vacation Home, AC, Foosball, Ping Pong & Brand New Hot Tub! Property 30: Reconnect to the Earth and Nature by experiencing the Tipi to the Sun. 55905 Wood Duck - Bright home w/views of the Big Deschutes River! Property 31: 55905 Wood Duck - Bright home w/views of the Big Deschutes River! Great Family Home within Walking Distance to Boat Dock! Pet Friendly Too! Property 33: Great Family Home within Walking Distance to Boat Dock! Pet Friendly Too! Property 35: River Song Sanctuary On The River, Just 2 Mi. From Sunriver, Near Mt Bachelor! Property 39: Great bright home with fabulous view of the Big Deschutes River! Riverfront home w/ private hot tub, dock - access to shared pools & tennis! Property 45: Riverfront home w/ private hot tub, dock - access to shared pools & tennis!